I don’t know why this has caused so many people to become flustered on other parts of the internet. It’s red doing the exact red things it always does, except in the context of enchantments. I think it has a lot of potential, too. “Punisher” effects are historically frowned upon by competitive players, but this offers the opponent a choice between losing a permanent that’s probably doing good work for them (and red has problems dealing with enchantments! ), or taking damage in a way that’s hard to prevent. And when you consider that Commander decks tend to have a higher mana curve than competitive constructed . . . This might be the “constructed plant” of Commander 2018, a very red way for red to deal with enchantments, one of its historic weaknesses. 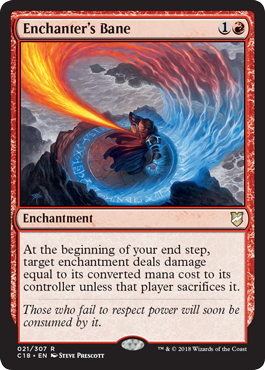 While it gives your opponent a choice, it does have the upside of both choices potentially being ideal for you and what red wants to do (read: all of the damage with little interference). While it’s nowhere near the power level of other Constructed plants in these sets, Enchanter’s Bane does have a solid use in Legacy sideboards. Be wary, though: if there are no other enchantments, Enchanter’s Bane will turn on you!